As a new homeowner who moved in the dead of the Iowa winter, our yard hasn’t gotten much attention yet. The warmer weather here has me thinking about how to best utilize our little backyard patio space. 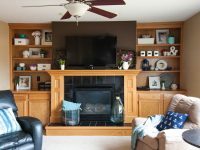 My goal is to find some thrifty ways to add a bit of color and pizzazz. 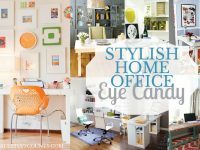 I’ve been looking for inspiration and ideas on how to make the most of my small space and thought I’d share some of my favorite ideas with you….maybe they will inspire you to dress up your backyard as well. Wow, pallet furniture has sure become trendy! I’m planning to jump on the bandwagon with some sort of patio furniture to fit my space. I loved this patio furniture made by Place Of My Taste. They made seating and a great coffee table with wheels and an umbrella stand. It looks so colorful and relaxing! There are also plenty of outdoor rug painting tutorials on Pinterest. This one by A Beautiful Mess is a bit different because…they painted directly onto the concrete! Not sure I’ll be ready to commit to painting my concrete quite yet, but the colors and design they used are fantastic. Painting the concrete would be more thrifty than buying materials for a rug, even a thrifty one that you planned to paint over. Paint can transform practically anything. 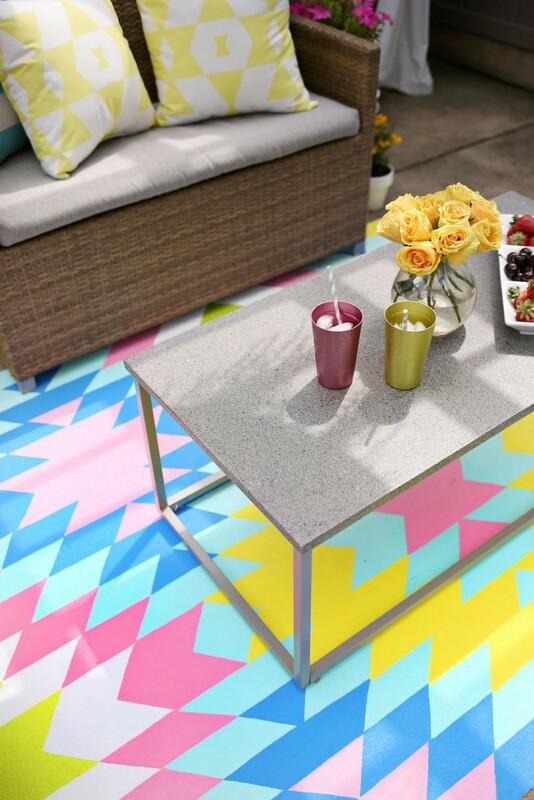 People have used paint to give new life to all sorts of patio furniture, whether it’s metal, plastic, or fabric. 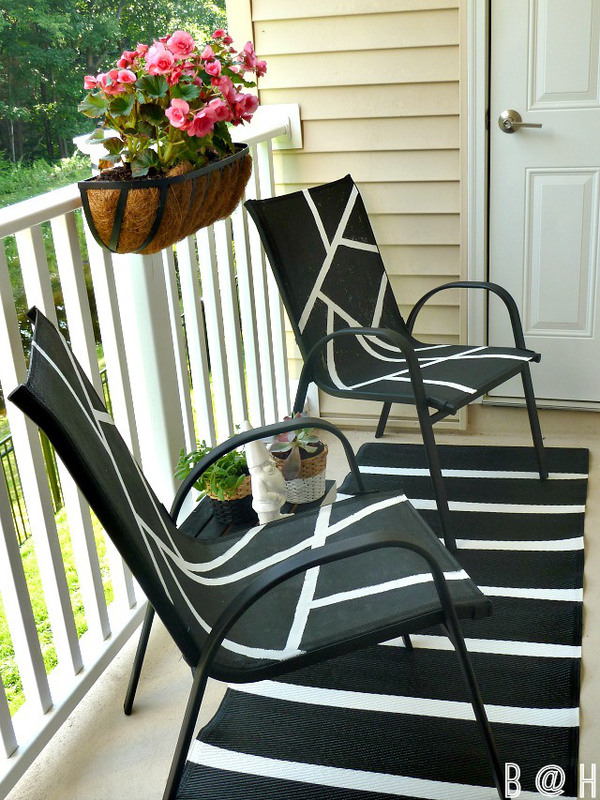 With a little paint, Bliss At Home added a modern black and white pattern to her chairs. This is so simple. No construction necessary, you just need some basic block stacking skills. 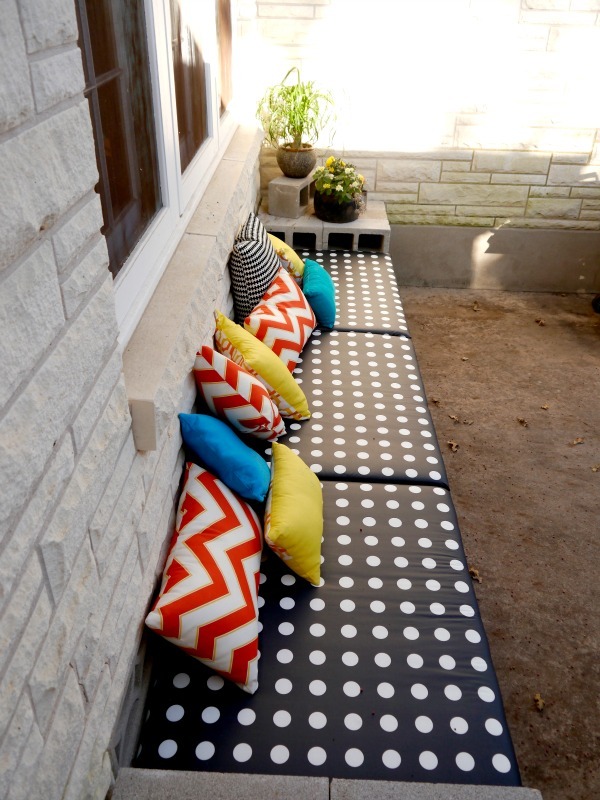 Add colorful cushions and pillows and you have a simple, durable bench. I love the mix of patterns shown in this example. 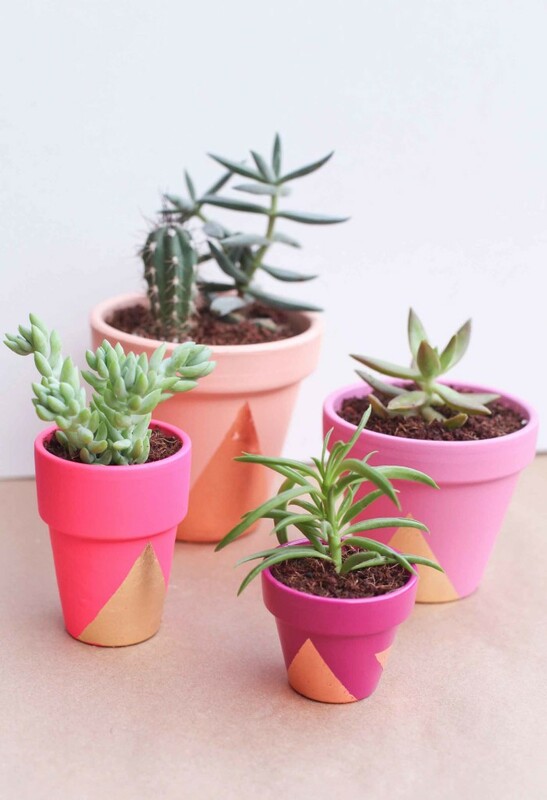 Who says you have to stick with those boring terra cotta plants you have sitting around? 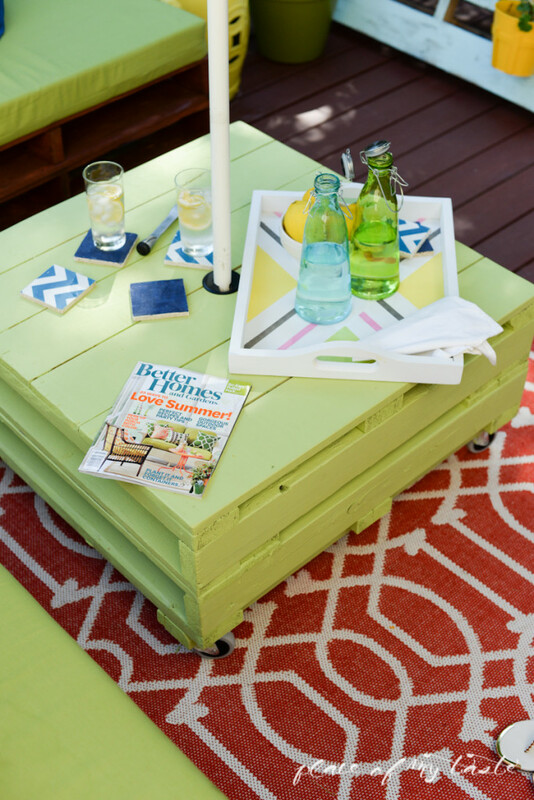 Add a colorful paint or a bold pattern using leftover craft supplies you have on hand. Here’s some bright pink inspiration for ya. These would be adorable sitting on a patio table. I plan to try this one out for myself, created by In My Own Style. I wonder how comfy these pillows are? They are stuffed with plastic grocery sacks. I love the idea of reusing sacks and that way the pillows are okay to leave out in the rain. 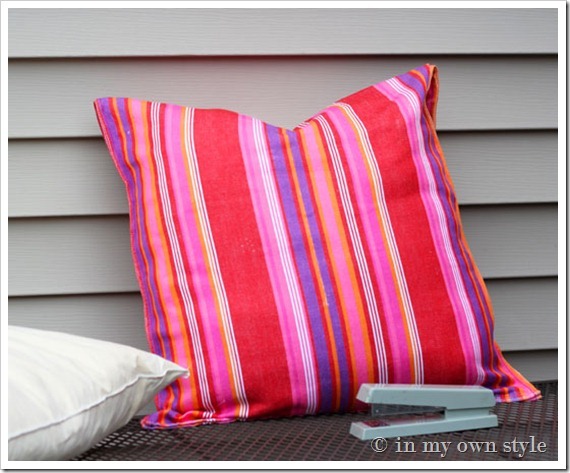 Colorful pillows are definitely a good way to add color and a bit of luxury to your backyard. I like the idea of spray painting an old chandelier to use on the back patio. 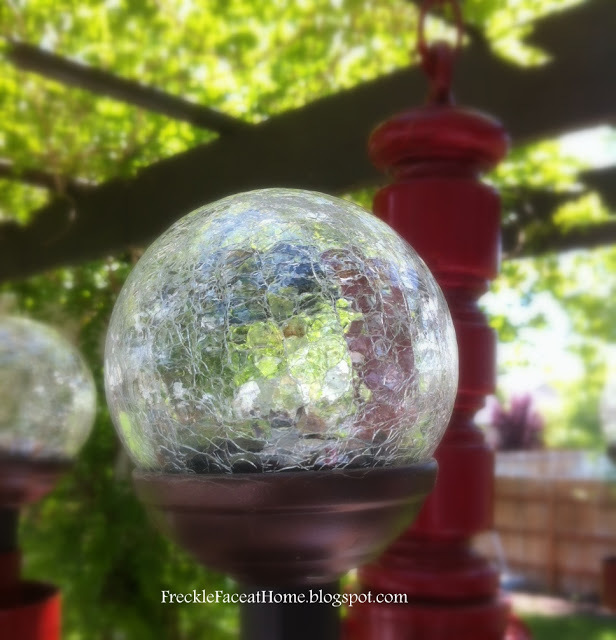 This tutorial explains how to add solar lights into the chandelier. 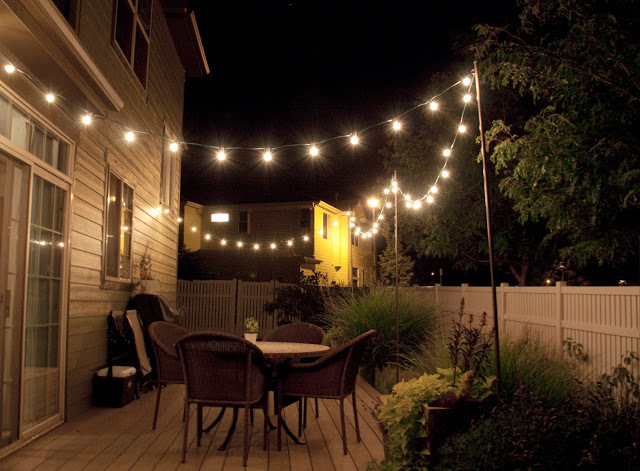 String lights are a wonderful way to add to the ambiance of your backyard. They are fairly inexpensive and are easy to hang. If you don’t have enough trees or walls to hang the lights from, follow this tutorial from Bright July to learn how they made their own sturdy poles to hang the lights from. And there you have it! 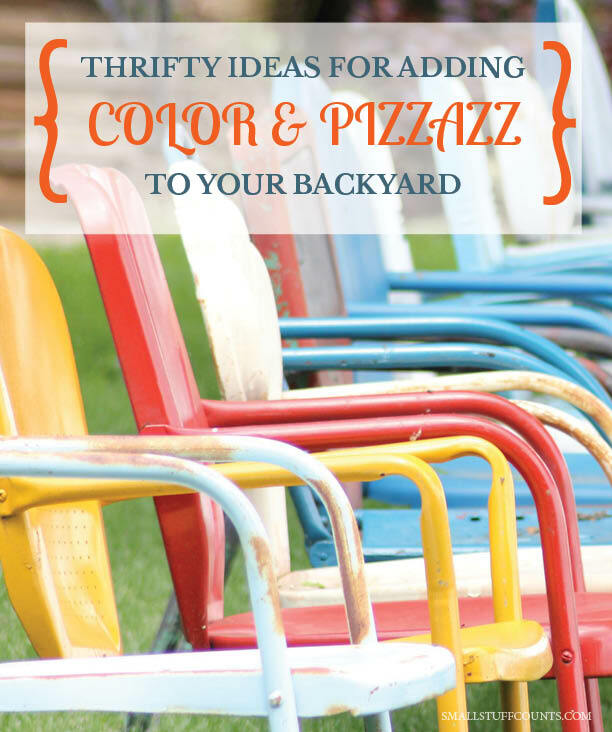 Some thrifty, colorful ideas for adding a bit of pizzazz to your backyard. What ideas do you have? Feature image credit to Kris McGuire. I follow your group on pinterest ‘Best of blogland’ and I really enjoy it. That is also how I found your blog. Veey cool space ? . I am a mom blogger at sweetashoneynz and I would love to be part of the group as well if you are happy to add. My pinterest login is sweetashoneyNZ. Thank you. Carine. I love these ideas. Some of them are impossible in my space but I especially like the idea of adding some pillows and stuffing them with plastic bags seems to be a great idea. Thanks! I hope your pillows turn out great! Let me know if they are comfy. 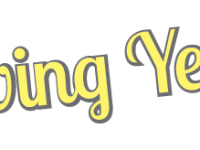 Good luck with your space and thanks for visiting! These are GREAT! We have lived in our house for 7 years now, and are just finally making some big changes in our landscaping and patio. I’ve never thought of doing these! 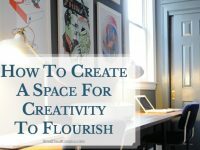 I hope this post sparks some new ideas you can easily incorporate into your patio/landscaping plan. Thanks for visiting!